Last Sunday was the Super Bowl where the New England Patriots took on the Philadelphia Eagles. A lot of people watch for the game. I tend to watch for something else…the commercials. Since I work in advertising, it makes sense. I wanted to give you a round up of my favorite commercials in case you missed them. Every Super Bowl ad is secretly a Tide ad. Funny…clever…original. Bonus points at how they managed to play off other famous commercials like Mr. Clean and Old Spice. Another bonus is that it features (David Harbour) from Stranger Things, and I love that show and him. Alexa loses her voice so Amazon hires “fill ins” to provide answers with hilarious results. I especially love the Anthony Hopkins a la Silence of the Lambs. Personally, I’m betting that Diet Coke Mango is super gross…but there is something about this strangely odd lady and her dancing that is both weird and weirdly mesmerizing. Maybe it’s her total deadpan expression. Pulling at the heartstrings is a popular theme, especially for Super Bowl commercials when giant corporations (who are paying millions to run a 30-second tv commercial Super Bowl ad) want everyone to think they "care". Sometimes these feel good commercials come off as overly saccharine, fake or preachy. This one works, though. It’s emotional and inspirational, without being cloying or hitting you over the head with how you're supposed to feel. This clever spot looks like a trailer for a new Crocodile Dundee movie or maybe a spoof (it even has a cameo by the original Crocodile Dundee), but it’s really a tourism ad for Australia. Honestly, I picked this one mainly because it features Chris Hemsworth. Peyton Manning on a trip to Universal Parks. Again, I picked this because I really like Peyton Manning and his delivery is great in this spot. I love how the little girl is trying to teach him how to use a wand a la Harry Potter, but Peyton can’t do it and is “uncoachable” in her words. A funny spot for Groupon, featuring comedian Tiffany Haddish who was probably the best thing about the movie Girls Trip starring Jada Pinkett Smith & Queen Latifah. Bodily functions are always funny, no matter how “mature” we think we are. This commercial is about a guy who’s #BleepDontStink done in the style of docudrama interviews. It’s cheeky and clever, and it makes a good point. You need Febreeze for the bathroom when you have all those guests over for the Super Bowl. Kristin Wallace is the USA Today Best Selling Author of inspirational and contemporary romance, and women’s fiction filled with “Love, Laughter and a Leap of Faith”. She is the author of two best selling series, Shellwater Key Tales (sweet contemporary romance) and Covington Falls Chronicles (inspirational romance). Her latest book, LOVING YOU AT CHRISTMAS, is available now at Amazon, iTunes, Barnes & Noble and Kobo. 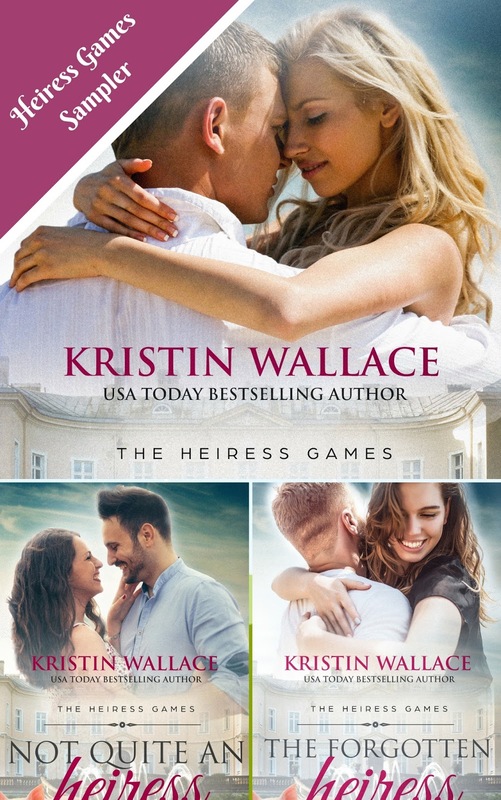 Look for Kristin’s new series The Heiress Games, launching in April, (Least Likely Heiress, Not Quite An Heiress & The Forgotten Heiress). Get a sneak peek at the series with a FREE Chapter Sampler with the opening chapters of all three books. CLICK HERE TO DOWNLOAD! Kristin, I love the Super Bowl commercials, especially Alexa. So fun! Looking forward to your 3 new releases, also. I can't choose just one!!! I could look at the one with Crocodile Dundee again and again. Love Chris Hemsworth. I cant get them to play but I love the Crocodile Dundee Australia add cos I am an Aussie and every Aussie in it did the add for free. It show cases Australia and is well done. Limited Time Sale for Three Book Series! Super Bowl Sunday...so where were you?